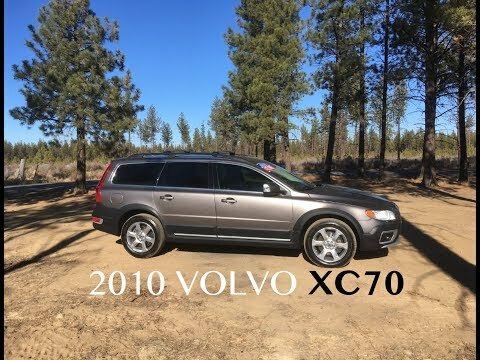 If your next vehicle needs such off-road attributes as all-wheel drive and Hill Descent Control, but a bulky SUV doesn't fit your image (or garage), the 2010 Volvo XC70 will definitely strike a positive note. It is a very safe car and is easy to drive. This is a reliable car, it gets decent gas mileage, can carry five people, and has many nice features, such as: seat heaters, many cup holders, ac, and a sound system. The downside is it is an older make, so it needs repairs every so often, which can be expensive. It's safe, and sturdy and easy to drive. I can easily detect the other cars around me. It has lots of features, it's safe, it's comfortable no can Carry the things I need to transport . I do wish the gas mileage was a little better. It's extremely reliable and safe. It's a family car. I love its reliability. It's a very safe car. Dislike the maintenance it requires. 2010 Volvo XC70 Review - the ultimate Subaru Outback? VOLVO IS RECALLING CERTAIN VEHICLES EQUIPPED WITH GARMIN 760 PORTABLE GLOBAL POSITIONING SYSTEM (GPS) UNITS BECAUSE THE BATTERIES ON THOSE UNITS MAY OVERHEAT. AN OVERHEATED BATTERY COULD LEAD TO A FIRE. VOLVO ADVISES OWNERS TO PLEASE STOP USING THE GARMIN PORTABLE GPS DEVICE IMMEDIATELY, AND VISIT THE GARMIN WEBSITE TO DETERMINE IF THEIR UNIT IS AFFECTED. THE UNITS BATTERY WILL BE REPLACED WITH A NEW BATTERY AND A SPACER WILL BE INSERTED ON TOP OF THE BATTERY NEXT TO THE PCB. THIS SERVICE WILL BE PERFORMED FREE OF CHARGE. THE SAFETY RECALL IS EXPECTED TO BEGIN DURING NOVEMBER 2010. OWNERS MAY CONTACT GARMIN AT 866-957-1981 OR VISIT GARMINS WEBSITE AT WWW.GARMIN.COM/NUVIBATTERYPCBRECALL. VOLVO IS RECALLING MY 2008-2010 S80, MODEL YEAR 2009-2010 XC70 AND MODEL YEAR 2010 XC60 VEHICLES. UNDER CERTAIN CONDITIONS THE SOFTWARE WITHIN THE CENTRAL ELECTRONIC MODULE (CEM) MAY NOT SEND A SIGNAL TO THE FUEL PUMP ELECTRONIC MODULE (PEM). THIS MISSING SIGNAL TO THE PEM INHIBITS THE START OF THE FUEL PUMP. THE DRIVER MAY BE ABLE TO START THE ENGINE IN SPITE OF THE FUEL PUMP NOT BEING ACTIVATED DUE TO RESIDUAL PRESSURE IN THE FUEL SYSTEM. IN SOME CASES, THE DRIVER MAY BE ABLE TO DRIVE THE VEHICLE A SHORT DISTANCE AT IDLE BUT THEN THE ENGINE MAY STALL. IF THE VEHICLE STALLS IN CERTAIN CONDITIONS, A CRASH COULD OCCUR. DEALERS WILL DOWNLOAD SOFTWARE TO THE VEHICLES' CEM FREE OF CHARGE. THE RECALL IS EXPECTED TO BEGIN ON OR BEFORE SEPTEMBER 31, 2009. VEHICLES IN DEALERS INVENTORY WILL BE REPAIRED PRIOR TO DELIVERY. OWNERS MAY CONTACT VOLVO AT 1-800-458-1552. VOLVO IS RECALLING CERTAIN MODEL YEAR 2010 XC70 VEHICLES MANUFACTURED FROM DECEMBER 5, 2006 THROUGH OCTOBER 1, 2009 FOR FAILING TO COMPLY WITH THE REQUIREMENTS OF FEDERAL MOTOR VEHICLE SAFETY STANDARD NO. 110, TIRE SELECTION AND RIMS. THE FMVSS LABEL, TIRE AND LOADING INFORMATION LABEL AND A PAGE IN THE OWNERS MANUAL CONTAIN INCORRECT MAXIMUM PERMISSIBLE INFLATION PRESSURE ACCORDING TO FMVSS 110. THIS DOES NOT MEET THE REQUIREMENTS OF THE STANDARD. THE CORRECTIVE ACTION IS TO UPDATE THE VEHICLES WITH A NEW FMVSS LABEL, TIRE AND LOADING INFORMATION LABEL AND TPMS SOFTWARE. VOLVO RETAILERS WILL ALSO APPLY A LABEL WITH CORRECT MAXIMUM TIRE PRESSURE INFORMATION TO THE OWNERS MANUAL. THIS SERVICE WILL BE PERFORMED FREE OF CHARGE. THE RECALL IS EXPECTED TO BEGIN DURING MAY 2010. OWNERS MAY CONTACT VOLVO AT 1-800-458-1552. VOLVO IS RECALLING CERTAIN MODEL YEAR 2010-2011 S80, XC70, MODEL YEAR 2011 XC60 AND MODEL YEAR 2010 V70 VEHICLES. THERE MAY BE AN INTERMITTENT FAULT IN THE DRIVER'S AIRBAG CLOCKSPRING WIRING CONNECTOR FOR THE SUPPLEMENTAL RESTRAINT SYSTEM. IN THE EVENT OF A CRASH, THE DRIVER'S FRONTAL AIRBAG MAY NOT DEPLOY AS INTENDED OR AT ALL, AND THEREFORE WILL NOT BE ABLE TO PROPERLY PROTECT THE DRIVER, INCREASING THE RISK OF INJURIES. DEALERS WILL INSTALL A METAL SHIM IN THE DRIVER'S AIR BAG CLOCKSPRING WIRING CONNECTOR. THIS SERVICE WILL BE PERFORMED FREE OF CHARGE. THE RECALL IS EXPECTED TO BEGIN ON OR BEFORE OCTOBER 29, 2010. OWNERS MAY CONTACT VOLVO AT 1-800-458-1552.